When it was released earlier this year, in the second week of January, Cascades by High Highs seemed pretty but insubstantial. It made intellectual sense; I could hear what they were shooting for, and why radio programming directors would feel that this song would fit on their playlists, but it didn’t make emotional sense to me as I listened to it, hurrying to Hither Green station in hat, gloves and heavy overcoat, or scurrying up St Martin’s Lane towards the office in hat, gloves and heavy overcoat, or, well, you get the picture. It’s not a song that makes most sense during an English winter. After a couple of weeks of listening to it, I found myself getting a bit bored and I moved on. Listening to it again more recently, when we’ve had some actual springlike weather (not this last couple of days, mind), I find it makes much more sense to me. Nothing’s changed musically. Those opening guitar arpeggios still smell strongly of the Alan Parsons Project as played by the Cocteau Twins’ Robin Guthrie. There’s that all-encompassing reverb haze that is the unvarying production norm of contemporary indie. The drums are rigidly four square, with a disco pulse underpinning, again entirely in keeping with current fashions. But Cascades’ washed-out late-summer mood makes much more emotional sense now. It’s a song for those days when the afternoons are still warm enough to send you in search of shade and a cold drink, but when the evening brings a refreshing coolness. Every day we get closer to summer, it feels more appropriate to me. This entry was posted in Music and tagged 1980s, 2010s, Cascades, Cocteau Twins, contemporary music, fashion in mixing, High Highs, indie, indie rock, mixing, Music, production, Robin Guthrie, sound recording, Sound recording and reproduction on April 24, 2016 by rossjpalmer. 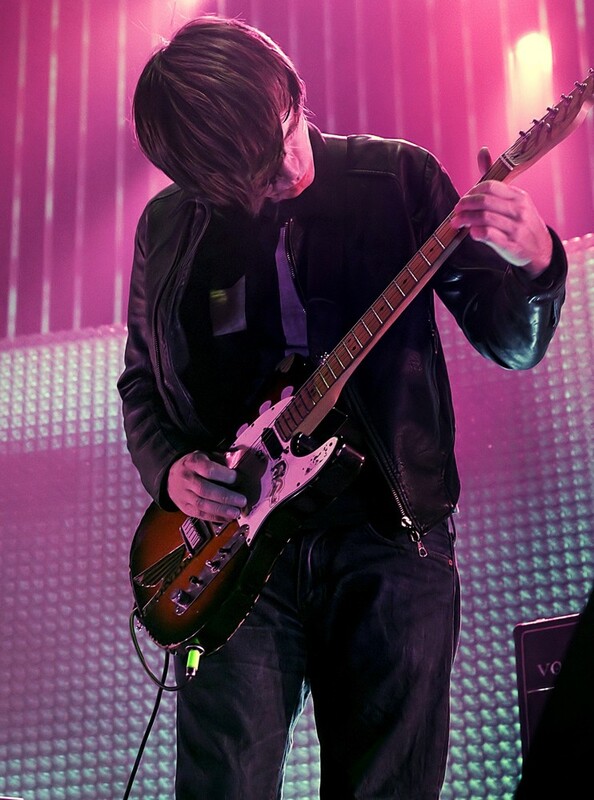 If you played guitar in the late nineties, you worshipped at the altar of Jonny Greenwood. Radiohead were one of those bands that transcended tribal boundaries. Metal kids liked them. Grunge kids liked them. Punkers liked them well enough too. It seemed like everyone who was into rock music, and certainly everyone who played it, liked them. For guitar players, the interplay between the group’s three guitarists (Greenwood, Ed O’Brien and Thom Yorke) was one of the chief reasons. The other was Greenwood’s furious lead guitar, which was in the tradition of such post-punker players as Keith Levene, John McGeoch, Johnny Marr, J Mascis and Robin Guthrie, and eschewed fast scalar runs and blues licks for textures, noise, dissonance, modal melodies and sheer squonkiness. True, he made use of oblique bends and octave chords – which in lead guitar terms were popularised by Hendrix and Wes Montgomery respectively – so he wasn’t inventing a new grammar of lead guitar out of whole cloth. But he was adventurous, dissonant, unconventional, angular and popular. There are hundreds of thousands of people my age who learned the Complete Works of Greenwood as 16-year-olds. Levene and McGeoch were great players, but in comparison, they are unknowns. My favourite piece of Greenwood guitar comes at the end of The Tourist, the closing track on OK Computer, when his raging guitar solo shatters the uneasy calm of the song’s previous three and a half minutes. It’s a moment as raw and exciting as his infamous muted grunts just before the chorus of Creep. It’s often said by folks who dislike fast guitar playing that if you can’t sing along to it, then it’s not a good solo. You couldn’t sing along to the solo on The Tourist. It’s not without melody, but the importance it places on tunefulness is way below that which it places on noise, on jaggedness, on impurity of form (remember that The Tourist mixes up bars of 12/8 and 9/8, so the song’s very form resists the deployment of easy riffs and phrases). It’s like some sort of unstoppable eruption. For a generation of guitar-playing kids, the solo on The Tourist was just the final piece of awe-inspiring guitar playing on an album full of them. And not that Radiohead haven’t made good music since, but the disappearance of Jonny Greenwood the guitar hero is a continuing source of regret to many of us. This entry was posted in Music and tagged Five Best Guitar Solos, Five Favourite Guitar Solos, Greenwood, J Mascis, Jimi Hendrix, John McGeoch, Jonny Greenwood, Keith Levene, lead guitar, OK Computer, Radiohead, Robin Guthrie, The Tourist, Thom Yorke on December 17, 2013 by rossjpalmer.